As with any new challenge, the prudent aspiring biker will start small and attempt to progress in attainable steps toward his goal. My first motorcycle represented such a meager beginning. The Suzuki S40 has a one-cylinder engine and weighs just 350 pounds. It’s a light and responsive bike, and while that single 650 cc cylinder delivers a lot of power, it’s just about adequate for a six-foot, 200-pound beginner. I was able to keep the agile S40 upright without much effort during the early phase of my learning. And the power provoked no concern. It was, after all, under the control of my nervous right hand on the throttle. At about this same time (9/08), my wife was taming her first motorcycle, too. It had less than half the power of the Suzuki and weighed in at the same modest size. Within six weeks we were both shopping for “bigger” rides. She wanted more power; I needed a frame that didn’t make me feel like was straddling a kid’s tricycle. You can see I have a lot of “space” between me and any meaningful part of the S40. And notice the single large, air cooled cylinder that ran with a lawnmower-like “thumper” feel. For basic in-town riding, that might have been adequate. But I now had my eye on the distant horizon, on the highways and back roads to America and the world. I needed the comfort of a heftier mount to carry the essentials and a few frills for a wandering existence. I needed more rubber on the pavement for stability and control. I wanted to get the feel of a bike build for longer rides. And I found it on eBay. My purchase from a dealer in Ohio boosted me from one cylinder to two, but with no increase in engine size. 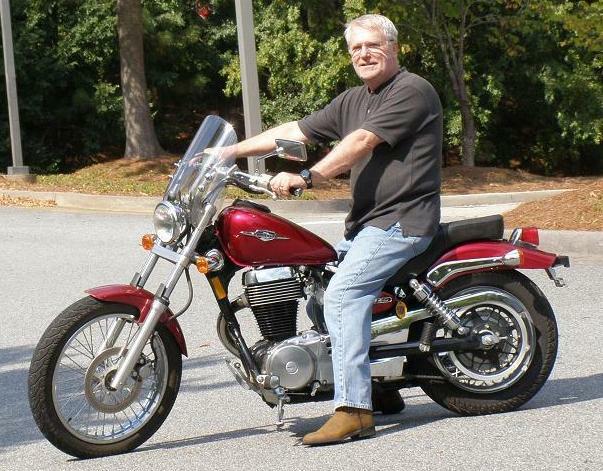 The twin pistons on my new Yamaha V-Star 650 Custom provided the same 650 cc displacement, but it was split between two off-set and complementing cylinders, resulting in a more efficient delivery of added power plus a smoother sound and feel. It was a good thing the V-Star could produce a few more horsepower; the bike weighed 180 pounds more than the S40.The heavier ride, the more comfortable seating and controls, the massive feel of the V-Star took me to a whole new realm of motorcycling. After riding a street bike like the S40, I now discovered the romance– almost the rapture– of piloting a cruising bike. 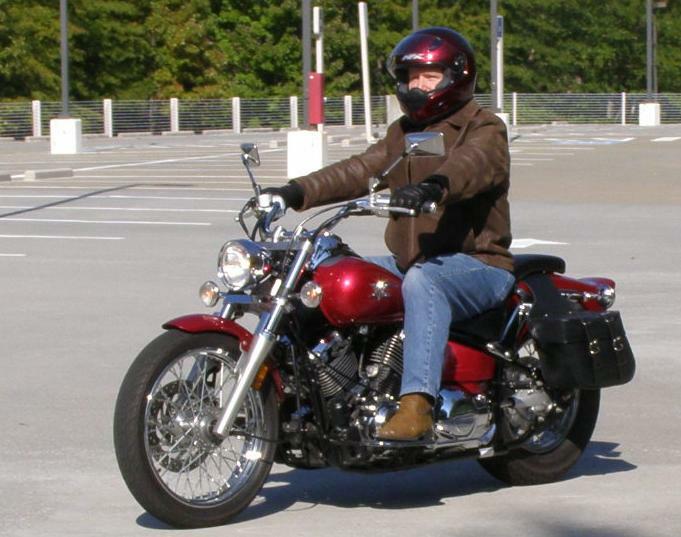 I rode the V-Star at every opportunity into and halfway through a mild southern winter. This was the machine that truly brought substance and promise to my plans for longer rides over greater distances. It taught me important lessons in managing the weight and balance of a serious road mount. And in those months it showed me an inescapable reality. As comfortable as the V-Star was for me alone, it would be a cramped environment if I added the kit and supplies that make it possible to live on the road. I needed a BIGGER bike. 2008 Suzuki Boulevard C50T. This was the first of my bikes that I named. She was my Black Beauty. In February of 2009… three weeks after I retired from CNN… and a month before my 67th birthday… I found The Black Beauty. 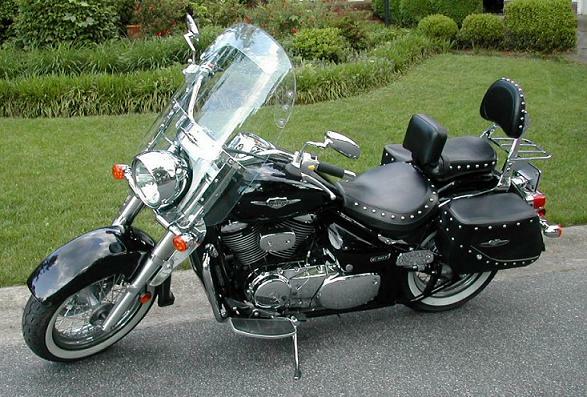 She’s an 800 cc touring model from Suzuki… fuel injected, radiator cooled, with shaft drive (no chain or belt). I added a luggage rack to enable her to carry more traveling gear. The luggage rack is a small shelf, mounted behind the passenger backrest, which bikers colorfully refer to as the “sissy bar.” While I had no plans to carry passengers, the sissy bar is an ideal upright support for securing a duffel bag full of traveling necessities. A month later, I did just that; I loaded up The Beauty for a 500-mile test of my highway touring system. An account of this first trip to discovery can be found at Taking To The Road. That shakedown cruise and three other road trips later in the spring and summer convinced me that I had all the pieces needed for comfort and satisfaction. But long hours at turnpike speeds seemed to test the limits of the C50T powertrain. The engine and transmission performed flawlessly but felt and sounded as though they were working at or near capacity. What I needed (here we go again!) was a little more power. Decades ago, when my obsessions were the sea and the reaching of distant shores, I was afflicted with the sailor’s strain of this same virus. Among sailboat skippers it was called the “the 5-foot syndrome.” Inevitably, those who would raise canvas before the wind are convinced that their fine ship could be made perfect by just five feet more of length on deck. So it was that my 32-footer grew to 37-feet before I crossed an ocean. But as comfortable and accomodating as she was– to me, a virtual palace afloat– by the time she floated in European waters, I yearned for five feet more. My 2009 Suzuki C50T offered an excellent preview of my 2006 Suzuki C90T. The Suzuki genes are strong… and so are the bikes. It’s impossible to overlook the resemblance beween the two Beauties. Their eye-pleasing similarities were, in fact, what determined my final choice when I went shopping for my “ultimate” ride. Other makes and models offered features and innovations that made them strong contenders. But in the eight months that I rode The Black Beauty, in places up and down the east coast from Georgia to Maine, she was a show-stopper. I got compliments on her classic style from passersby wherever I rode. Motorists, stopped at traffic lights, would roll down their windows just to utter the inevitable “Nice bike” and give a smiling nod of approval. I didn’t want to sacrifice that distinct image in moving to a smoother, less labored ride at turnpike speeds. And in the end, I didn’t have to. Now, whenever I whip out pictures of my adventures on the road, I don’t bother to explain which bike I was riding. Visually, the transition was seamless; practically no one notices that The Black Beauty of the past has become The Big Beauty of the present and of the future… which came much earlier than expected. As much as many new riders want the biggest and best right away, your progression through the sizes is the best way to becoming a well rounded motorcyclist. And the other way to becoming a well rounded motorcyclist is spending too much time in restaurants. I progressed through the sizes as well, with some time spent in the dirt, but I have yet to blog about it. I need to do that. Later I progressed through the various models of Goldwings, 5 total.